All the essential information you need before you head out to Ibiza this summer! Fly from: London (Heathrow, Gatwick, Luton, Southend or Stansted), Belfast, Birmingham, Blackpool, Bristol, Cardiff, East Midlands, Edinburgh, Exeter, Glasgow, Glasgow Prestwick, Humberside, Liverpool, Manchester, Newcastle and Southampton. Weather: Temperatures average 26-32𐩑C in summer. July-August are the hotter months in Ibiza with each month averaging of 13 hours of daylight. Water temperatures can reach up to 26𐩑C in peak summer. 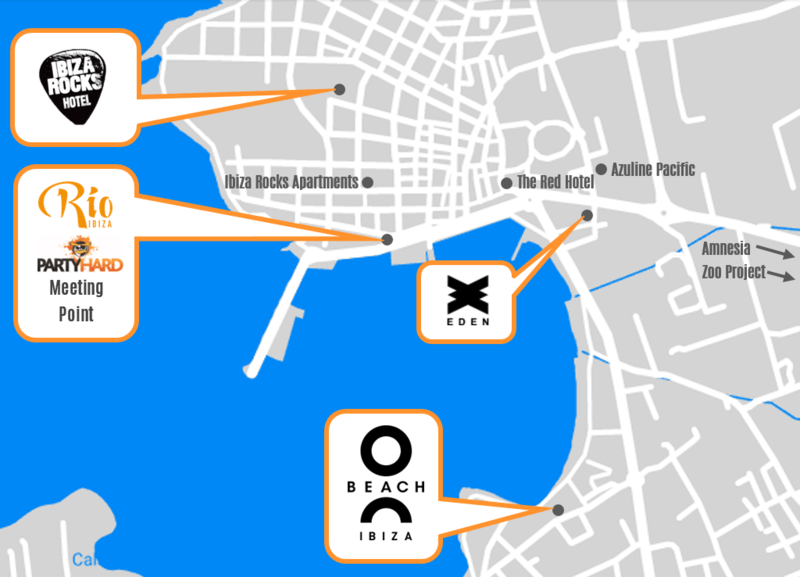 When to go to Ibiza: Peak season in Ibiza is July – August, but clubs and events are open from June-September. So if you’re looking to save some money, try June or September for your Ibiza clubbing holiday 2019. Health & Safety: For travel to Ibiza you need to have travel and medical insurance; you never know what can happen on a night out! Although it’s not a substitute for insurance, it is also a good idea to get yourself a free European Health Insurance Card (EHIC) before you head out to Ibiza. It potentially entitles you to any medical treatment should it be necessary during your trip (whilst Great Britain is part of the EU) so don’t forget it when you’re packing. It’s worth noting that the EHIC will not cover you if you require ongoing medical treatment, so if you take medication long term be sure to bring enough with you in case there are any unforeseen delays to your flight home. Find out more here. Passport & Visas: You won’t need a visa to travel to Ibiza, but you will need a valid passport. Make sure that your passport is valid before you leave, and will remain valid for the duration of your stay. If your holiday is coming to an end before you’re ready to return home, you are permitted to stay in Ibiza for up to three months. Any longer and you would have to apply for a residence permit. Healthcare: The hospital in Ibiza is called Can Misses which is located near Ibiza Town. There are a number of healthcare centres in Ibiza if you need one for smaller emergencies. In San Antonio it’s at Ses Sequies, 6 and there’s one in Ibiza Town and Santa Eulalia depending upon where you’re staying. Just don’t forget your EHIC. Police & Security: The emergency number in Ibiza is 112. If you need to speak to the police and your Spanish isn’t fluent then call 902 102 112 to report the crime. If there’s a safe in your room it’s always a good idea to put your valuables in there. ATMs: You will find a number of ATMs in Ibiza, but before you use them, be sure to check with your bank how much they will charge you to withdraw, as most ATMs will charge you a transaction fee as well. A number of clubs, bars and restaurants allow you to pay by card, however not everywhere will, so be sure to have a combination of cash and card. You can also use prepaid currency cards when you stay, which allow you to top up an amount before you leave, and budget your spending.